Urban Moonshine is a Vermont-based company that produces organic digestive bitters and herbal tonics. Bitters are traditionally an alcohol tincture infused with medicinal plants that have positive effects on the body. The use of bitters dates all the way back to ancient Egypt. We can now use these ancient remedies for our modern needs. These tinctures are great for any digestive problems, for cleansing the liver and can help control overeating. Sounds too good to be true, but at Expo West I stumbled upon this stand just after consuming a really sweet ice cream that was sending my body into sugar high mode. I asked for a remedy and with a few sprays of the citrus bitters my spinning head began to quiet down. We all want white pristine teeth and fresh smelling breath, but what is really in all of those “quick fix” oral products? 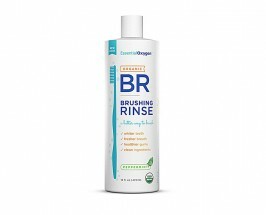 I was on the search to find one that is full of clean, certified organic ingredients, which actually works. Essential Oxygen was founded by Mystica Linforth, who nine years ago, had advanced periodontal disease. After months of dentist appointments and many dollars spent on special products, she tried an alternative therapy. She swished a blend of food grade organic hydrogen peroxide, aloe vera and potent essential oils in her mouth. Within three days she was getting compliments on her white teeth, in a week her gums weren’t bleeding anymore, all her tooth sensitivity issues were gone and hours after swishing her breath was still fresh. When she went back to her dentist he confirmed that her oral disease had been stopped in its tracks and tartar was nowhere to be found. Bottom line, this one is a game changer. There seems to be a lot of paleo snacks for the modern hunter-gatherer but are they all legit? 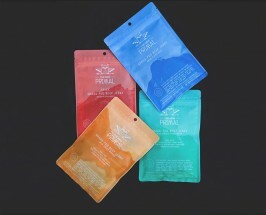 The New Primal jerky is delicious, humane and easy for on-the-go healthy snacking. The ingredients in every recipe are always gluten-free, free of antibiotics, free of hormones and contain words you know and can actually pronounce. Founder, Jason Burke, said that their farming partners provide up to four times the roaming area of average commercial turkey ranches. This free-range practice ensures the highest quality living conditions and produces a healthier and better-tasting jerky. The animals are respected and the company’s mission is to inspire and empower people to change their relationship with food. Many of the ingredients in our skin care products come from nature, but which brands actually put their profits back into the source? Tanya Hawkes, founder of Therapi, is a well-respected beekeeper with over 17 hives – a bee whisperer who harvests her own honey and puts at least 5% of profits back into bee conservation. It’s no secret that honey is good for our skin – containing the essences of thousands of flowers in a single drop – and you won’t find much else besides honey and propolis in these bottles. The scent is incredible. 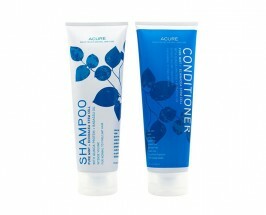 Have you found a hair care product that’s natural that doesn’t completely dry your hair out or ruin your color? I’m sure many of you are like me and have been on an endless search for the healthy holy grail of hair care. I can’t tell you how pleasantly surprised I was when I tried Acure. This affordable hair care has all the healthy certifications we are looking for: color-safe, paraben-free, sulfate-free, phalate-free, cruelty-free, certified organic, fair trade, biodegradable packaging, etc. The best part is that it actually nourishes the hair just like a high-end salon product would without using scary ingredients. Like celeb makeup artist Katey Denno says, “We don’t want to wash any harsh chemicals down the drain and into the ocean,” and now we don’t have to. Our hair and our oceans will thank us for it. Melanie Banders started this delicious business out of her kitchen in Venice, CA. When she became a mom, her life got busy and at times she didn’t have time for a full meal. She still wanted something healthy that she could grab that was delicious, healthful and chemical free. So she decided to make a food product for herself. 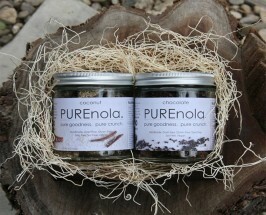 Meet Pure Nola, the granola that’s made with absolutely real ingredients like organic cacao, coconut flakes, raw seeds, coconut oil and maple syrup. What also makes her Nola different is that she soaks and sprouts her ingredients. This unlocks nutrients and makes the nuts easier for digesting. All the work is done for us. It’s pure, simple and utterly delicious. Did we get your attention with the name yet? Good. Stacy Lyon created Healthy Hoo Hoo, a line of fresh feminine care products, when she discovered that most mass-marketed intimate cleansers and body washes are laden with harsh detergents, dyes, parabens and synthetic fragrances. These chemicals not only upset a woman’s natural balance but also open the door for unwanted bacteria and other discomforts. Her products are made of clean ingredients that cleanse your most precious parts without putting them in danger. Happy healthy hoo hoos for all! Science and nature go hand in hand at Bottega Organica. 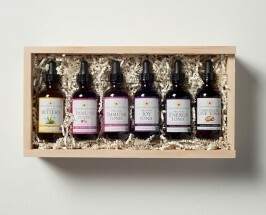 The all-natural skincare line contains ingredients that are well-researched and are meticulously crafted. Their ingredients are harvested and processed naturally from their farms in Italy and upstate NY, straight from farm to bottle. You won’t find any preservatives, emulsifiers, artificial fragrances, colors or synthetics of any kind. It all began while Dr. Andrea Alimonti, one of Bottega Organica’s founders and a world-renowned geneticist, was studying a novel cure for cancer. After screening thousands of different combinations, he was able to identify natural substances with the potential of slowing the aging of human cells. Those ingredients are what makes up this incredible line. You can buy them online or at their brick and mortar location in the West Village. They products are stunning and backed by science. This is our pick for smarty-pants health addicts. A pioneer in the healthy skin care world, I met Dr. Alkaitis himself and his lovely daughter Trish. 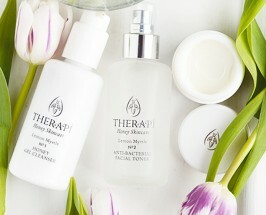 They explained to me that they have brought clean skincare to people for over fourteen years. Dr. Alkaitis has a whole line of products but I was able to try their mask. I got my DIY on and mixed it with organic raw honey and yogurt. 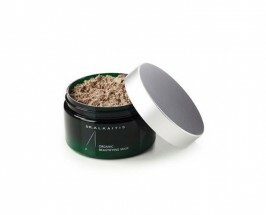 I blended these ingredients with their “skin food” formulated from 39 different kinds of vegetables. It turned into this silky paste, I applied it to my skin and then I let it do its thing for 20 minutes. Upon removal, I had never seen my skin glow so much with an at-home treatment. This is really the take-the-spa-home-with-you mask. This is the type of glow you have post-facial. All it took was a little mixing in my kitchen (keep in mind you can also mix the mask with water). A big yes to this classic line! 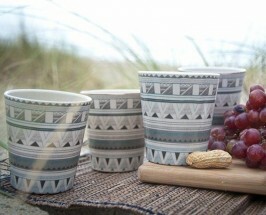 Get ready to restock your kitchen with these consciously cool cups by EcoSouLife. It’s the perfect combination of design and sustainability. This set of cups is re-usable, dishwasher safe, heat resistant and biodegradable. If you “plant” these cups in the ground they will become one with the earth in two to three years. Made from vegetable waste matter such as cornstarch, bamboo and rice husks, they have a delightful lightweight feel and a smooth texture that feels just like stoneware or melamine, without the toxic production process. This is the perfect alternative to plastic plates, cups and cutlery. Why should we compromise the planets resources for aesthetics? Now we don’t have to.